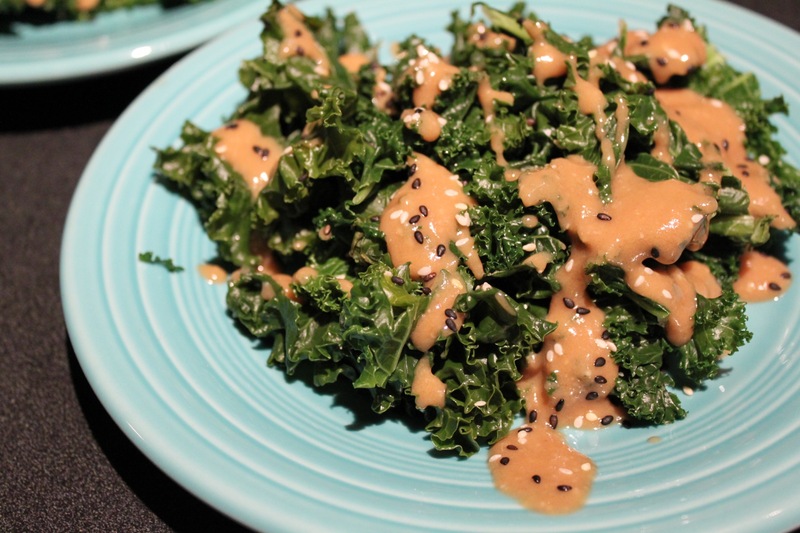 I was throwing together an Asian dinner tonight and had some kale that needed to be used tonight or I would lose it. I decided to grab a tub of miso at the store and whip up some dressing for it. It was delicious. (If I do say so myself!) I’m still learning about all the different types of miso, so I randomly chose mellow white miso. It was great both in the dressing and the soup I made out of it (recipe to come later on that…). I might thin it out a little next time with some water or a bit more vinegar, but all in all I’d say this was a winner. I think it would work well as a dip for raw veggies or egg rolls too. In a blender or by hand (which is the option I chose) whisk together the following until smooth. Check back tomorrow for the simple miso soup recipe and a bit of info on miso, which is packed with protein, vitamins and minerals! Entry filed under: Appetizers & Dips, Dressings and Sauces, Recipes, Salads, Side Dishes, Uncategorized. Tags: Miso, miso dressing, miso paste, side dishes, vegan, vegetarian, white miso. I have been looking for a great miso dressing to make up for the fact that I cant go to m fav place, Souen, in NYC while im in FL. THANK YOU! Thanks (to both of you!). And where are you in Florida, Sarah? We’re heading down to visit some relatives in February so we’ve researched some vegan/veg restaurants. Let me know if I can be of help! This looks tasty! Thanks for sharing. I’ll be adding this to my dressing repetoire (like it’s that extensive! ).